With the rumored closing of the Indian Boundary Zoo, I was wondering about the history of that unusual neighborhood zoo and wondering what other zoos may have existed in Chicago other than the Lincoln Park Zoo (or Brookfield Zoo). 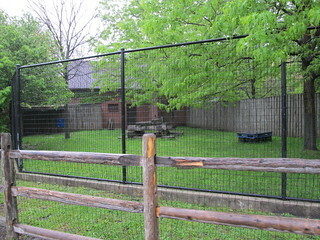 I have heard that the Indian Boundary Zoo is the only remaining neighborhood zoo of what once were several neighborhood zoos. Is this true? What other zoos have existed in Chicago, where were they located, and what is there now? Turns out, there was once a menagerie in one of Chicago's west side parks with a live bear named Bob. Watch what happened to the Union Park Menagerie.